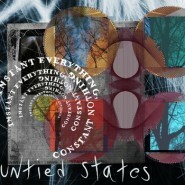 The newest of what is now three albums from Untied States, Instant Every­thing, Con­stant Noth­ing seems to be going for the full inter­na­tion­al approach, per­haps in con­trast to the band’s name, a more region­al­ly focused play on words. To be more spe­cif­ic, Atlanta based Untied States released Every­thing a few months back in the UK only. It is now (this com­ing Tues­day) releas­ing the album in Europe and the US, under the French label Dis­tile. But logis­tics aside, Instant Every­thing, Con­stant Noth­ing is very good, if often some­what strange. Clear­ly exper­i­men­tal, but done by a band that could eas­i­ly have played straight rock had they so desired, Every­thing is a tru­ly inter­est­ing album. While Untied States makes a habit of includ­ing gen­er­al­ly flaw­less intro­duc­tions to many of their tracks, the band leaves plen­ty of time for tracks’ main bod­ies. Tracks’ com­po­si­tions usu­al­ly fall some­where between one of two extremes. On one end are tracks like “Not Fences, Mere Masks,” which is made up of mul­ti­ple small sec­tions, each of which stands out on its own, that are then strung togeth­er with no tran­si­tions what­so­ev­er. While as a result, the track as a whole has lit­tle to no direc­tion, or at least gives the lis­ten­er no sense of direc­tion, the indi­vid­ual sec­tions are among the best on the album. They are always engag­ing, dense, but by no means over­crowd­ed, unique, and nev­er played for too long. On the oth­er end of the track spec­trum are those that fall to a some­what more con­ven­tion­al approach of larg­er, more con­nect­ed sec­tions. In gen­er­al, these tracks aren’t quite as well played, but they have the dis­tinct advan­tage hav­ing a nav­i­gat­ing light, if pale and dis­tant. On Instant Every­thing, Con­stant Noth­ing, lead singer Col­in Arn­stein cre­ates a very dis­tinct vocal pres­ence - quite fit­ting for such an exper­i­men­tal album. Begin­ning with the choral echo of “Unsil­vered Mir­rors,” Arn­stein mod­u­lates his voice in a vari­ety of ways from singing with Thom Yorke-esque into­na­tion to the much harsh­er vocal edge of tracks like “Delu­sions Are Grander,” to every point in between. Arnstein’s voice, even through the most chaot­ic parts of Every­thing, is fit skill­ful­ly to the music. The only prob­lem with the vocals then, are that they often get engulfed by the rest of the music, even when the music could most use their direc­tion. The lyrics of Every­thing aren’t always easy to under­stand. This is, how­ev­er, not espe­cial­ly prob­lem­at­ic giv­en Untied States’ dense sound. Rather, they con­tribute more to the music as sound than as lyri­cal con­tent, though a few (gen­uine­ly inter­est­ing) lines do poke through. In gen­er­al though, the prime func­tion of the lyrics seems to be to allow Arn­stein to actu­al­ly sing some­thing, rather than, say, moan for the entire length of the album. Untied States attempts to exper­i­ment in as many ways as pos­si­ble with Every­thing, with quite sol­id results. The com­bi­na­tion of Col­in Arnstein’s dis­tinc­tive tones and the ener­gy of Untied States’ musi­cal ele­ments cre­ates a high lev­el of lay­er­ing which cours­es through the album, demon­strat­ing Untied States’ skill at craft­ing even the most abstract of sound. It’s not per­fect - occa­sion­al mis­steps and a gen­er­al lack of dis­cernible direc­tion detract some­what from the over­all qual­i­ty of Instant Every­thing, Con­stant Noth­ing, but for the most part, cre­ativ­i­ty tri­umphs over these flaws.